1. Measure your wrist with a flexible tape measure or a thin strip of paper just below the wrist bone(below the bone is after your wrist bone, towards your hands). Wrap the tape or paper around the cuff of your wrist. 2. 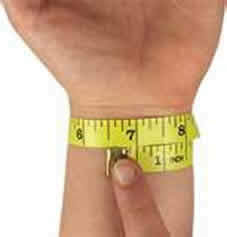 Get the circumference of the wrist. If you are using a strip of paper, mark the spot where the paper meets the other end. Measure the distance between the spot with a ruler. If when ordering you made a mistake in your choice of size we do have a service to help you. The resize service is offered at a cost $8 for one bracelet and $1 for each additional bracelet (price includes redelivery). The process for resizing is four steps. 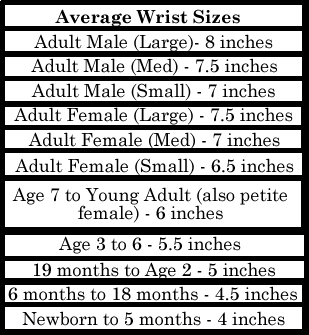 1) Mail the bracelet(s) back to us with a note that explains what the size(s) need to be adjusted to and your accurate email. 2) Once we receive the return we will send you the invoice for the resizing. 3) Once the invoice is paid in full we will make the modifications. 4) Allow up to three weeks after the invoice is paid for redelivery and then wear with style and confidence.